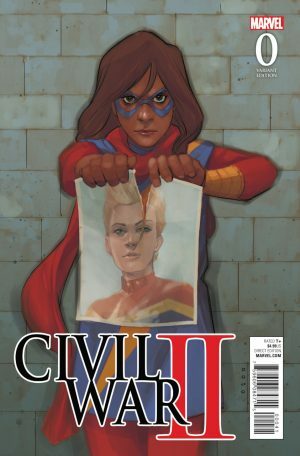 Marvel Comics’ Civil War II #0 Spoilers & Review: A Rift Is Forming By Brian Michael Bendis, Olivier Coipel, Justin Ponsor! Note: This issue precedes the Free Comic Book Day edition from eleven days ago. All talk and no action. Barely. 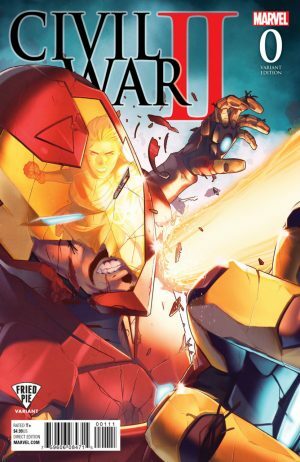 Three former Avengers are featured as well as the emergent Inhuman Ulysses. Six segments are divided into four three-page vignettes as well as one six-pager concluded by five others. Jennifer Walters a.k.a. She-Hulk is doing her day job: attorney-at-law. She delivers an extremely impassioned conclusion to her case. She pleads to the jury that they not convict former criminal Jonathan Powers (his villainous identity will be revealed near the end). He should not be guilty by association nor judged for his past misdeeds. He was arrested due to his alter ego even though he was committing no crime nor was he in costume. Shulkie admits that she is less than thrilled to represent him but she asks that the law be upheld. Equality must be spread among humans, mutants, Inhumans. He was the victim of entrapment which is questionable. Freedom of all sorts must be maintained. War Machine deescalates a potential uprising in Latveria. No bloodshed. *phew* The man behind the armour, Col. James Rhodes, meets with a shadowy figure in the Situation Room of the White House. It’s the most secure bug-free camera-free room in the entire complex. The unseen individual offers Rhodey the position of Secretary of Defense. That ends up being a fake-out since it is implied that Rhodey take over the man’s Presidency. It’s even speculated by the man in black that Tony Stark must vie for POTUS. Rhodey is gobsmacked. He needs to process. The choice is entirely his own. Ulysses (real name) is a regular teen attending Ohio State University. He’s mustering up the courage to ask out his classmate Michelle. Just before he can utter the single sentence, she indicates the massive Terrigen Mist heading in their direction. Some are in awe. Others speculate the outcome. It moves at such a speed that none of the youth can observe yet alone find shelter. The cloud passes through them so quickly. Ulysses and the object of his affection are now in cocoons. Captain Marvel (Carol Danvers) asks for a sit rep when she lands on the Triskelion. She has the most unexpected visitor: Dr. Leonard Samson. At first what seems like a casual conversation ends up being a mini psycho-session. Carol is somewhat miffed but lets it go. She somewhat envies Samson’s retirement from super-heroics and enjoyment of civilian life. He avers that some higher-ups are concerned about her mental state. One is always ‘on’ if one is a super-heroine. Samson asserts that super-heroes are always and forever the first line of defense. There will never be a moment’s rest or reassurance of normality. She-Hulk lands on a S.H.I.E.L.D. Helicarrier and chats it up with Director Maria Hill. The two barely exchanged two sentences. Hill brings up the Jester. At first, She-Hulk is at a loss but then Hill mentions his civilian identity – Jonathan Powers – the very man Jen defended. Jen knows she lost her case but this is nothing new to her. Hill informs the jade giantess that the reformed criminal was killed in his jail cell. Jen is somewhat outraged that an innocent man was slain. Hill remains unconvinced since he was a repeat offender and would have most likely gone back to a life familiar to him. Ulysses emerges from the cocoon. Reports stand at the ready grilling him. The teen is completely dazed and still processing the ordeal. He barely has time to gather his thoughts when Michelle comes out in monstrous form. Ulysses staggers. His eyes glow red. He has a vision of the future. A major metropolis is laid to waste. He wonders if he is the culprit. The foundation has been laid. The players are in place. Since this chapter occurs before the FCBD edition, the rare downtime for our heroes and heroines is a rare thing indeed. I have a theory!! It just hit me. 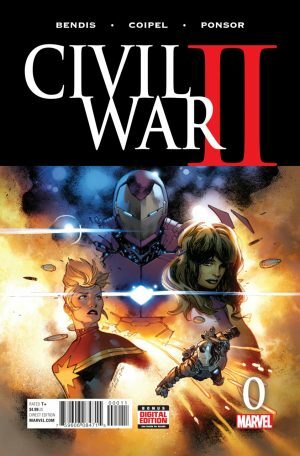 Perhaps what happened in CIVIL WAR II FCBD is one of Ulysses’ visions. Mr. Bendis delivers some pertinent points. I’m impressed with his voice superimposed on Ms. Walters’ closing statement. Charles Soule, watch your back!! On the flipside, his co-creation of Maria Hill is vehemently opposed to any super-powered miscreants. 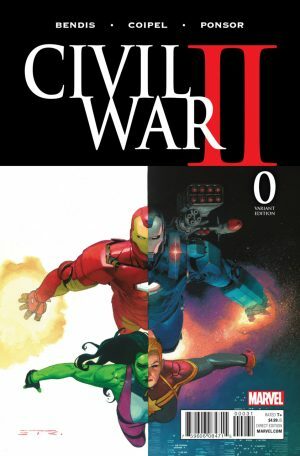 I’m all for She-Hulk and War Machine being at the forefront. I love them as much as the next guy. I fondly recall their adventures with Earth’s Mightiest Heroes’ different branches. It was always a delightful guessing game wondering which character would join their ranks. However, I’m not crazy about the idea that one or both will be the sacrificial lamb(s). Odds lean that way even though we may all be hoodwinked. The catalyst to create a new schism among the super-hero community sure seems to lean on either Jen or Rhodey. 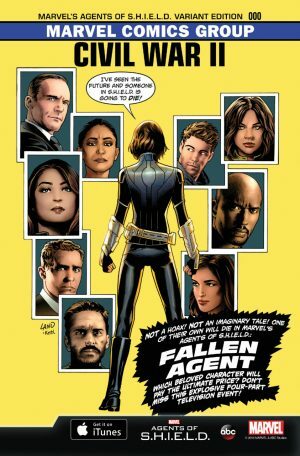 Mr. Bendis has become a modern-day Stan Lee. Prince Hamlet’s “words, words, words” retort definitely applies here. Dialogue reveals character development and advances the plot but there is too much!! I bemoaned at T’Challa’s comment in CWII FCBD. The coming about of a brand-spanking new player in the MU is always welcome but the name Ulysses makes me think of the Distinguished Competition’s recent misguided counterpart to the Man of Steel. At least it’s the teen’s real name rather than a codename. 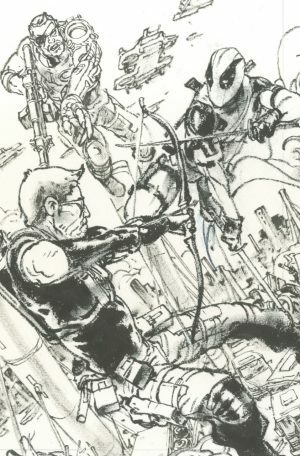 Olivier Coipel has come back to work with Mr. Bendis. The duo have collaborated on some of Marvel’s greatest hits!! Jennifer is cool and confident in the courtroom. I truly see her as a skillful caring lawyer and completely forgot about the green skin. War Machine is menacing, hovering above Dr. Doom’s kingdom. If I were one of the revolting peasants and unaware of his affiliation, I’d quiver in my boots as well. The cocoons don’t look very ‘cocoony’. It’s anyone’s guess what Michelle has become. Justin Ponsor clicks with the main stars. The women have fabulous complexion. War Machine’s armour leans towards the morally ambiguous or neutral. In contrast, the Terrigen Mist looked indistinguishable from any storm system. Clayton Cowles provides clear large-print boxes that act as chapters. He really earned his keep with the copious dialogue. I leave things on this note: Doc Samson is back from his permanent dirt nap!! He sure looks fresh as a daisy and is cool as a cucumber. Who are his superiors? Will he providing therapy for the two opponents and their followers?? For those expecting slam-bam-wham in this opening salvo, disappointment follows. The price is a bit high for the page count. I give this entry 6/10. Here are some variants for your purchasing pleasure. A heaping amount of gratitude to my local comic shop!! 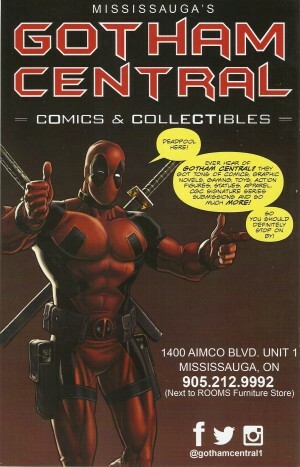 Comic book junkie, now blogger/reviewer. Trilinguist. Educator of many. Complex individual with simple insights.